Want to know the reason behind my absence in blogging? I've dedicated all my time to help my friend to start Malaysia's first beauty box! It is called Fashion Culture Box. Akin to Wantable from US and Her Fashion Box from Australia, Fashion Culture Box's aim is to bring you the latest fashion - whether on print, online or in the form of tangible product. We have sent out our very first box. This is just a pilot box, it is not available for public to purchase. We only have 2 themes for the recipients to choose - Queen of Hearts and Queen of the Fairies. Want to see what's inside? These are the stuff you can expect from Fashion Culture Box. You will receive fashion products, accessories, beauty products and a printed copy of FCZine. 3. A vintage choker. This is the star item of this box. This choker is 100% handmade. 4. Sun & Moondust Duo Bangle. It is a pair of silver and gold bangle. 6. Bloop nail polish. Extra glossy, fast drying and non-clumpy. Bloop is currently my favorite mid-range nail polish. To subscribe, go to http://fashionculturebox.com/. And check out our weekly Monday giveaway on our Facebook page https://www.facebook.com/fashionculturebox. 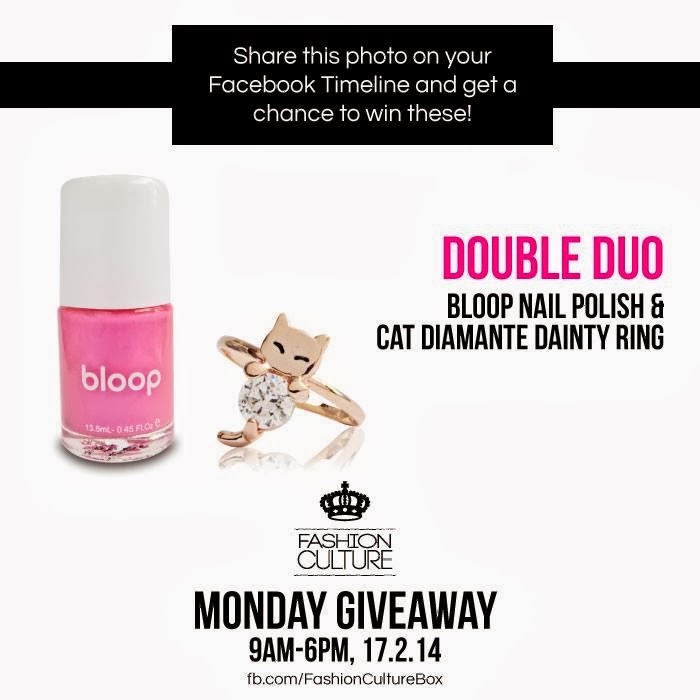 This week, we are giving away Bloop nail polish and Cat Diamonte Ring. Remember to follow us on FB for announcement, fashion tips and more giveaways! Let me know what you think of the box in the comment below? We just started, and would like more inputs from everyone so we can improve better.